ICAX Limited designed the Asphalt Solar Collector as part of the ICAX Solar Road System for use in Interseasonal Heat Transfer. An Asphalt Solar Collector is an efficient means of collecting a large amount of warmth to raise the temperature of a ThermalBank from the natural temperature of the ground up to over 25°C: solar recharge of the ground. Black roads tend to absorb the heat of the sun up to the point when they radiate heat as quickly as they are absorbing it: the surface temperature of roads in direct sunshine can often reach 15°C higher than the ambient air temperature. ICAX collects heat using fluid circulating through an array of pipes embedded in the surface of the road and deposits it in ThermalBanks constructed beneath the insulated foundation of buildings. The temperature across a large ThermalBank can be increased from its natural temperature of 10°C to over 25°C in the course of the summer months. 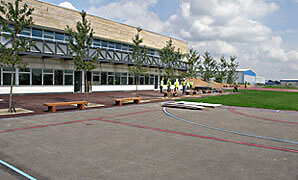 ICAX gives a second function (heat collection) to standard building fabric (roads or school playgrounds) that will need to be built in any event. The marginal extra cost of adding solar collection to a planned road is less than the cost of buying dedicated solar thermal panels. There is no visual impact. ICAX uses a heat pump to recover warmth from the ThermalBank in winter and deliver heat via underfloor heating into buildings to provide heat without burning fossil fuels. 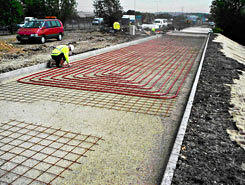 In this demonstration for the Highways Agency at Toddington on the M1 in Bedfordshire a road was constructed with an array of piping embedded in the road surface. Solar energy was collected from the road surface in the summer months, stored in underground thermalbanks, and returned to the same road in winter to maintain the surface above the freezing point of water. Where road space is limited there are alternatives to collecting heat from an Asphalt Solar Collector: heat can also be collected from Solar Roofing,a Watertight Solar Collector, an Underfloor Heat Collector or from standard flat plate solar thermal panels. The marginal cost of adding solar collection to an asphalt road that is going to be made anyway is less than £100 a square metre installed. The marginal cost of adding solar collection to a flat roof that is going to be needed anyway is £140 a square metre installed. The equivalent flat plate collectors can be £600 a square metre, before the installation costs of mounting and plumbing. The Renewable Heat Incentive is available to those who collect solar thermal energy for heating domestic hot water. An ICAX asphalt solar collector can be used to generate hot water as well as to charge a ThermalBank in summer to enable Interseasonal Heat Transfer to provide space heating cheaply in winter by using ground source heat pumps linked into a warm Thermalbank. Additional RHI is also available to those who have ground source heat pumps installed. IHT has always enabled you to save carbon: the RHI means that IHT can save you cash as well. There is a tendency for modern buildings to have a high need for cooling. This is particularly significant for high occupancy buildings with passive heat gains from people, lighting, computers and high solar gains from extensive use of glazing in the facade. Many commercial buildings in South East England have annual cooling loads which are larger than the heating loads, even in the cooler months. For these buildings an ICAX asphalt solar collector can be used in reverse as an asphalt heat rejector. The asphalt heat rejector can be used at night to reject heat from the building to the night sky. It can also be used on winter nights to reject heat from a thermalbank. 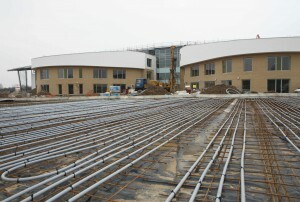 This allows a large volume of ground to achieve significantly lower temperature which can be retained over the spring and used in summer for the building to reject heat to – this permits natural cooling of the building at a fraction of the cost of air conditioning.